Alberts green apple fruit chew. A bite size chewy candy with a long lasting green apple flavor. When it comes to apple flavored candy these are hard to beat. Kids seems to find apple candy to be one of there favorites. If you like apple chewy candies don't forget to check out Apple Laffy Taffy here or Green Apple Frooties. We also have a great selection of apple flavored hard candies. Take your pick from Claey's Apple Drops , Apple Jolly Rancher Sticks or everyone's favorite Caramel Apple Pops. 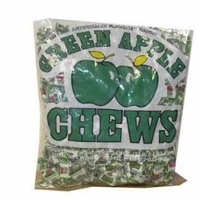 Each bag has 240 individually wrapped green apple fruit chews.